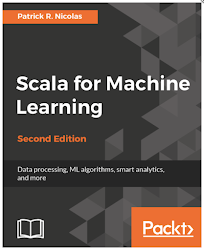 The Scala programming language API provides developers with a set of short immutable maps of predefined length, Map1, .. Map4, Set. I thought it would be worthwhile to evaluate the performance of those short, dedicated collections compare to their generic counterpart. 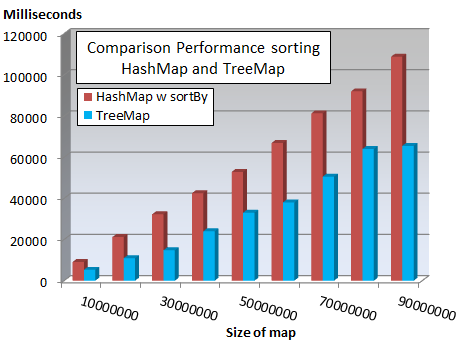 A second test consists of comparing HashMap with TreeMap for sorting a hash table by key. The benchmark consists of a very simple methods calls on immutable Map and Map4 instances as well as a mutable HashMap as defined in the code snippet below. The results of the performance test is shown in the table below. As expected the "short" collection is faster that the immutable Map and the mutable HashMap. However the performance improvement is not very significant. The test is set-up by creating pseudo-random key by concatenating the name of a city with an unique id. The values in the map are completely random. Sorting a tuple (String, Float) using TreeMap is roughly 40% faster than populating a HashMap and sort by key.